I signed up to “The Making it in Design School” Summer Camp which started a few days ago – I signed up to two of the levels but picked just one to work on as I have also signed up to the Lilla Rogers Global Talent Search 2014 which starts on Tuesday so that should keep me busy for a bit! I scanned a doodle and tidied it up and had a play… I do love pulling shapes out of other shapes and I can get carried away so I have to stop!! I seem to end up with a leaf shape all the time!!?!? playing around with a motif that has been scanned and tidied in illustrator. Here’s some swim suit mock ups – the brief is for Retro Geometrics on Swim Wear (there are shorts too) and the colour palette was also chosen for inspiration. 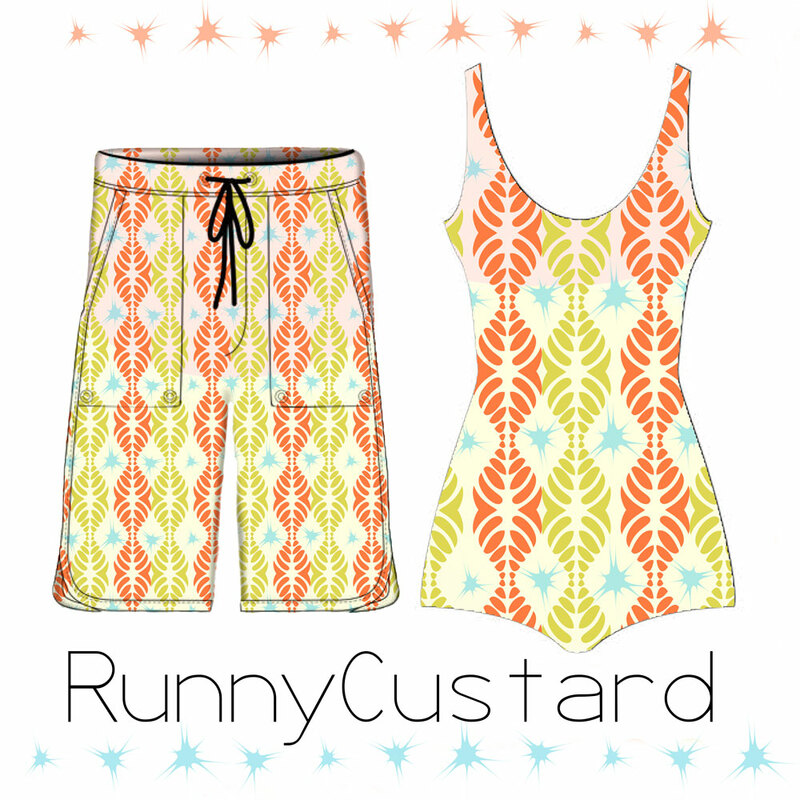 mockups on swimsuit – selection. I decided to add some of the patterns to the Print All Over Me website to see how they look on different products – these are for sale so go check it out! I will update with the final submission and link to the gallery which goes live later this week once it’s finally completed – I hope to submit today or tomorrow. I’ve decided to submit this one as I have other work to do and really needed to submit something by tonight.